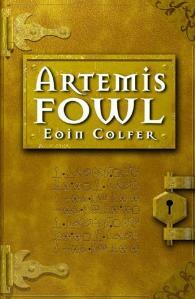 Artemis Fowl by Eoin Colfer kept me eager to turn the page with its many unexpected plot twists. This book is about a 12 year old boy named Artemis Fowl, an evil genius that is determined to bring the Fowl’s back to billionaire status. His dangerous plan to do so involves holding a fairy named Holly Short captive in his house. Then there is Artemis’s bodyguard Butler who is multi martial arts expert that is the brawn in this money making operation. Their enemies/hostage were Commander Root, a LEP (fairy police) officer with a bad temper, his hostage Holly Short who is the first female LEP officer and Foaly the centaur that keeps all the fairy technology ahead of human technology. However, Artemis underestimates his technologically advanced opponents, and this cockiness contributes to an ending that I never saw coming. I enjoyed the many of the characters because of their very different personalities. Also, I liked how Eoin Colfer brought in some game changing characters like Mulch Diggums in the middle of the book. Another aspect of the book I liked was how Colfer kept on relating back to never underestimate your opponents, because of Artemis’s frequency to do so. It was also very cool how Colfer explained all the different species in the fairy world like dwarfs, trolls, elves, goblins, centaur and pixies. Colfer’s writing style of changing from 1st person to 3rd person, wasn’t a vital part of the book, but it intrigued me and kept me reading. However sometimes this technique made the text confusing. I also liked the how Colfer switched which character’s perspective the book was being told by every one or two chapters. Due to these factors I would recommend this book to reader that like futuristic technology and action packed stories that are include many different perspectives full of cliffhangers and plot twists. I can’t wait to read the next book in this series.